My husband Mark and I have been are getting ready to celebrate our 34th anniversary, and 25 of those years were happy ones. Marriage has always been up and down for us, but six years ago Mark really lost his way and found himself in a midlife crisis…affair included. He was disillusioned with God, the church, and marriage. He eventually left me, our five children, and headed off to pursue this new relationship. Four months later, God got ahold of his heart and he returned home repentant and fully surrendered to God. Our marriage was in pieces and it took us 18 months of counseling and commitment to put the pieces back together. In the midst of that journey, we discovered the concept of slow fades. You see we were always intentionally “working” on our marriage. We knew each other’s love languages and spoke them often. We had date nights. We did getaways on a regular basis. We were intentional about communication. In the midst of that much intentionality, infidelity became a part of our story. How in the world did that happen? Looking back, it wasn’t the big things that made a difference. It was the little things. Things that simmered under the surface. Things unnoticed. Unattended. Untouched. These unknowns began an unraveling that gained momentum over time. No marriage crumbles in a day. It’s a drift of one centimeter to another, one feeling or one decision that leads to another feeling or decision that’s a little off-center. If left unaddressed, those feelings will draw us away from each other instead of toward each other. No marriage crumbles in a day. 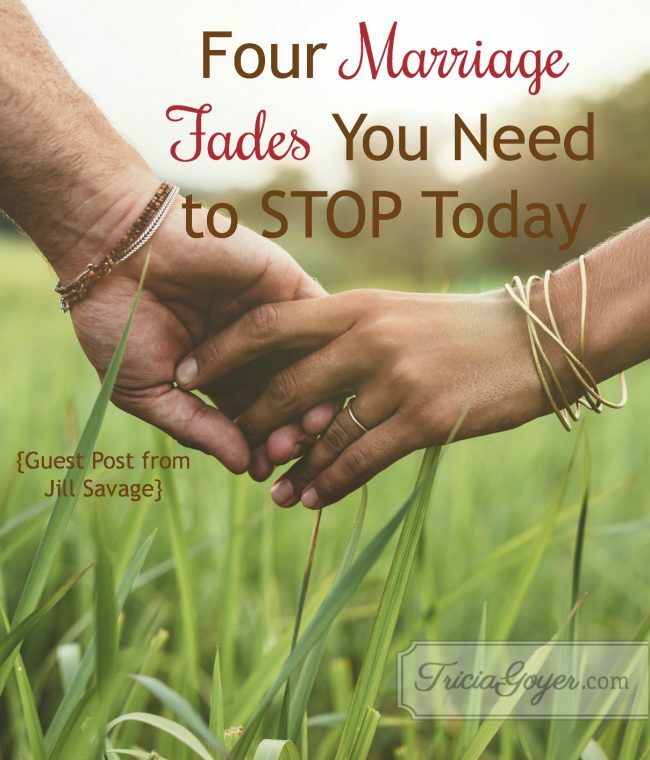 In our healing process, we identified seven fades that were pulling us apart. Most marriages experiences these fades, the challenge is to see them and do something to stop them. Maybe you can see some of these in your marriage if you know what to look for. The Slow Fade of Unrealistic Expectations—We all come into marriage with expectations. Some are from our family of origin. Some are from our own unrealistic thoughts (“I shouldn’t have to tell him, he should just KNOW!”) Left unidentified these lead to a sense of discontentment in our real marriage that doesn’t match up to the unrealistic expectations in our head. That disillusionment pulls us away from our spouse. The Slow Fade of Minimizing—There are two kinds of minimizers—internal and external. Internal minimizers minimize their own feelings. They tell themselves their thoughts and feelings don’t matter. External minimizers minimize the feelings of others. They tell others they are over-reacting and their feelings are wrong and not valid. Both kinds of minimizing move us away from each other inch by inch. The Slow Fade of Not Accepting—When we first get married, our differences are fascinating! Give it a few years (or a few months!) and those differences are downright frustrating. It’s at that point that we often determine the other person isn’t just different…they’re completely wrong. Then we set about to change them, separating our heart from our loved one one centimeter at a time. The Slow Fade of Avoiding Emotion— When it comes to personality temperaments, there are thinkers and feelers. Both ways of processing this life are needed but thinkers have to learn to feel because a guarded heart causes disconnect and emotional distance. Every time we stuff our feelings we shut down intimacy and move away from our spouse without even realizing it. The slow fades may be the bad news but there’s good news! You can turn those fades around and the first step in doing so is to become aware that the fades exist! You’ve taken the first step today by simply reading this post and educating yourself! Want to take a next step? Sign up today for the FREE No More Perfect Marriages E-Challenge! In four weeks, you’ll intentionally move towards your spouse, stopping some of the fades in their tracks! That may just be the best Valentine’s gift you could ever give to your spouse! 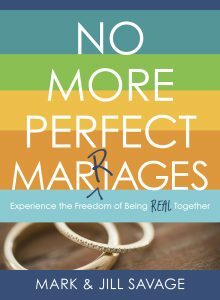 Mark and Jill’s book No More Perfect Marriages is releasing February 7 and available to order today! 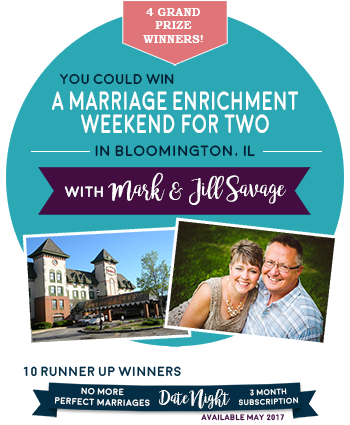 In fact, if you pick up a copy before February 13, you can enter to win a marriage enrichment weekend for two! Jill is an author, speaker and the Founder of Hearts at Home, a ministry to moms. The author of 11 books, Jill is passionate about faith and family. You can find Mark and Jill’s weekly Marriage Monday posts at www.JillSavage.org. I think that while this speaks of a hard topic, and one that is needed, it holds a slight twist of blame. True, you were blaming yourselves, but truly, when someone chooses to commit infidelity, they are choosing to sin. Most people that have experienced infidelity or being abandoned by their spouse all would have things they wish they had done differently. That is human nature. However, I think we often think that if we had changed it or done that, we would have prevented the sin. This is a key point that I think readers need to know and see. Sin is sin is sin. We all have choices we can make. If a husband chooses to sin against his wife, abandon her, betray her and their family, that is his sin and his choice. Even if she were the absolute perfect wife and did all those things you mentioned, it still likely would have happened. If a wife commits adultery, it is her choice and her sin. I think we need to be careful and stop doing the backwards, “If I only did this in my marriage, it would have prevented this.” when it comes to sin. When we start addressing the sin and the choice to fall, betraying our spouses, we will then be able to heal marriages in our land. But when we see someone in a failing marriage and we say, “If you did this, it would have changed this outcome.” we are playing blame where it ought not to be.